We have just been to Hampton Court, where we too saw a spectacular display of Disas in colours ranging through red, pink and yellow, and all the subtle nuances in between. But I think of Maya Angelou’s book, I know why the caged bird sings. 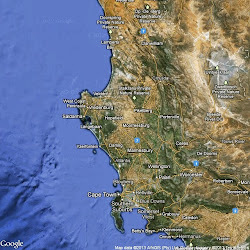 If you go to Google Earth and click to the natural landscape overlaid with the map of roads and towns, then start at Cape Town. Perhaps you have been there? Head up the west coast to Saldanha and Langebaan Lagoon (been there too?) in search of Namaqualand’s spring flower display, which will be coming soon. 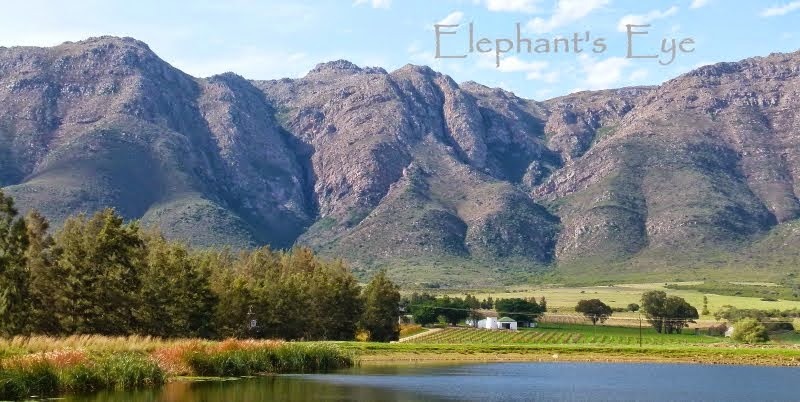 Then swing inland to the foot of the Groot Winterhoek mountains, with the Olifantsberg foothills spread before them, and the little town of Porterville nestled between wheat fields and mountains. 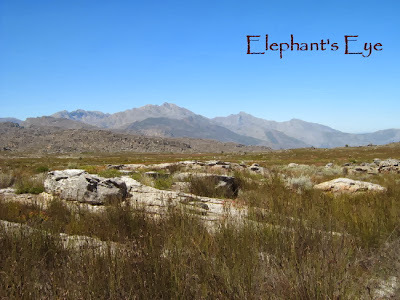 Drive north out of town, follow the dirt road to the foot of the Dasklip Pass. Up the pass on a good tar road to the paragliders launch platform, with a spectacular view across the wide open plain, all the way back to Table Mountain on a clear fine day. 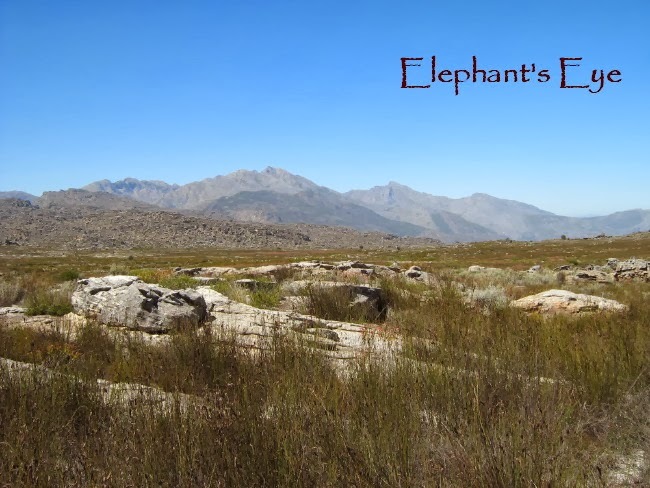 Then bounce over a rough dirt road following the crest of the mountain to the Groot Winterhoek Wilderness Area. Olifantsberg are the foothills, which, for the town, conceal the mountain peaks behind. 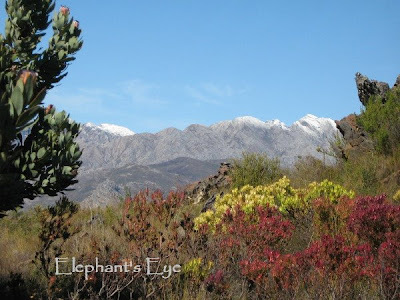 When they are garnished with snow, they are so high that they can be seen all the way from the city of Cape Town. BUT, we are privileged that our low altitude means no frost in the garden. Hooray! Our mountains are part of the Cape Fold Belt, stretching all the way from Table Mountain to the Cedarberg. Because the mountains are built of Table Mountain Sandstone, we have steep and glorious cliff faces (similar to the mesas and buttes in the American landscape), overlaid on granite at Cape Town, and Malmesbury shale as you head this way (via Malmesbury of course). Those high cool dripping rock faces are where you find, if you are particularly lucky – wild Disas! There the music is a silence so profound it makes your head spin. A breeze rippling through the grass. A moment of bird song. The stream burbling over its rocky bed. And the very loudest noise is the reverberation from our stomping boots……. PS Thanks to Autumn Belle -"the hills are alive with the sound of wildflowers dancing in the wind." 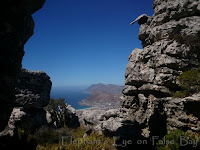 Years ago, when we lived in Camps Bay, the Ungardener and I went hiking up to the old water tunnel. The Twelve Apostles face west, out to the Atlantic Ocean, and into the full force of the afternoon sun. When you eventually clamber, gasping, up to the old water tunnel, there is a very high, seems like half a mountain high, south facing cliff face, covered with ferns and mosses (you can paint your own picture …) Now, scatter into your picture tongues of red flame, the red Disa, also known as the Pride of Table Mountain! There were once a very few yellow Disas, but someone dug them all up, now there are none. I wonder who destroyed the last remnant of that wild population? ‘Fess up. 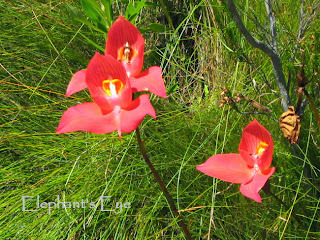 I did have a “caged” Disa, with a flower- but it sadly died in captivity. I prefer that moment of joy from the God who created the delightful surprise of seeing a Disa unfenced. My Swiss friend asked me "What is a Disa?" 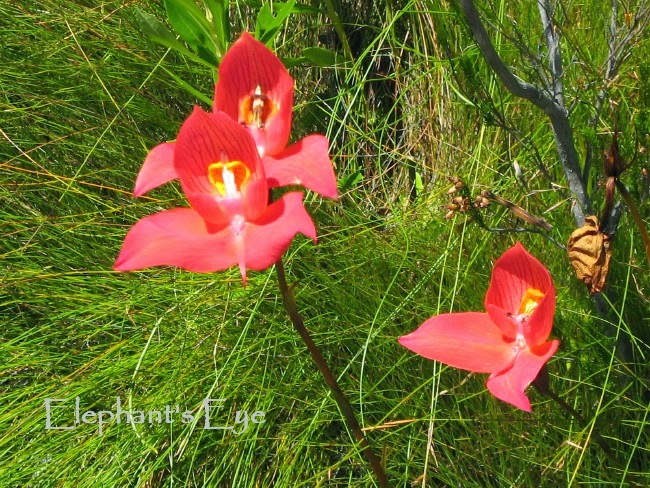 Disas are only one of our many indigenous orchids. 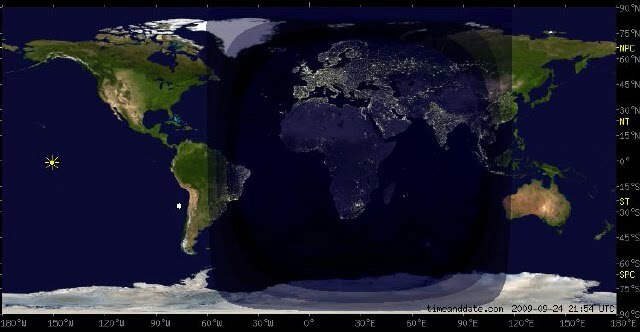 Apparently we have three times as many as Europe. The plant was named by the Swedish naturalist Thunberg, who visited Cape Town in the 1770's, on his way to Japan. And again, who knew, Disa is the heroine of a Swedish legend - so you could call your next daughter "Disa." Grateful thanks to Wikipedia, which is always a wonderful first call for information on anything, and secondly a good place to find links to reliable websites. If you want to know about cultivation go to Plantzafrica website. Monty walked that pipetrack flat! Went out with a flask filled with something, and a rock bun and brought it back with mountain stream water ~ lovely!